Garie Waltzer was born in New York City and received her BFA in painting and MFA in photography from State University of New York/ Buffalo. Her photographic work has been honored with grants from the National Endowment for the Arts, Vermont Studio Center, LightWork, and the Ohio Arts Council. She is a recipient of a 2011 Ohio Arts Council Award in Excellence in Photography and the 2012 Cleveland Arts Prize. 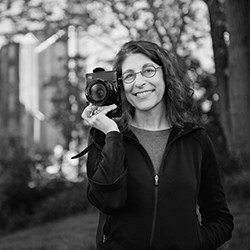 Waltzer developed the photography program at Cleveland’s Cuyahoga Community College where she chaired the department and taught for many years. Garie Waltzer’s work explores the convergence of time, place and populace. Exhibited widely, her work can be found in the permanent collections of the Cleveland Museum of Art, the Robert B. Menschel Media Center/ LightWork, The Museum of Fine Art, Houston, The Cleveland Clinic Foundation, The Cleveland Foundation, The George Gund Foundation, McKinsey Corporation, Progressive Insurance, Xerox Corporation and many other corporate and private collections. Projects include a commissioned photo essay for the George Gund Foundation; fellowship residencies at Light Work in Syracuse, NY and Vermont Studio Center; inclusion in Light Work’s Fine Print program and publication in Contact Sheet; commissions from The Cultural Landscape Foundation and American Photo magazine for the traveling exhibition Landslide 2010, and a commissioned book piece of a designed landscape for private clients. Recent exhibitions include Living City in both Singapore and Hong Kong. She is currently working on projects that examine the contemporary cultural landscape, including a book piece on Vietnam’s urban spaces. Home base is Cleveland, Ohio. © 2019 garie waltzer. All Rights Reserved.